No matter one’s occupation, once you reach a certain age existential questions begin creeping in to the psyche. Did you chose the right direction? What could you have done differently? Did that one decision alter your life? Dwelling on such thoughts is a fruitless exercise, especially for indie rockers approaching middle age. 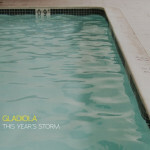 Such positing is done on “Greatest Hits,” the second single from This Year’s Storm, the forthcoming LP from Boston’s Gladiola. Flipping through the mental notebook of life’s failures, singer Bill Madden-Fuoco seeks to put his affairs in order, only to wander aimlessly and distracted. Yet, the power-pop “Greatest Hits” hints at the unknown path being perhaps our best option. This Year’s Storm will be released on 12 February. Stream “Greatest Hits” below.